I help host a children's book themed preschool co-op. 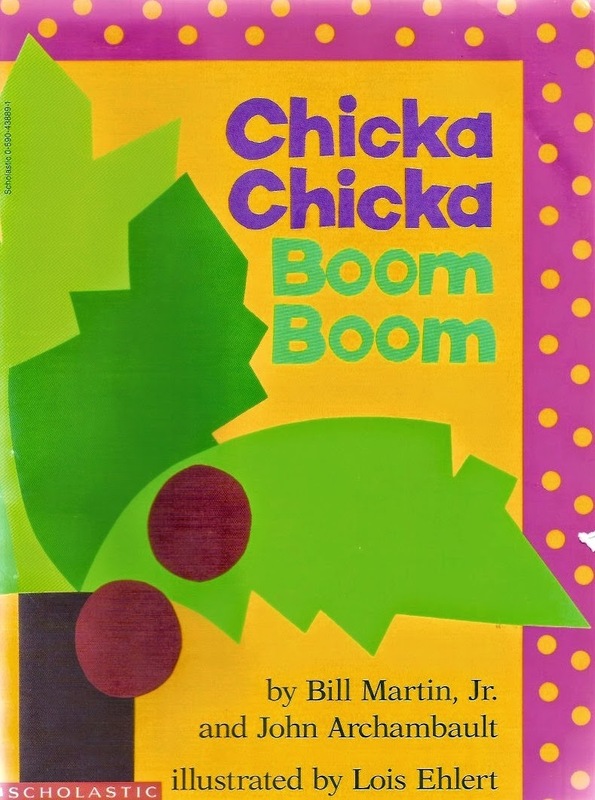 Each week we select a different book to feature and this week I chose Bill Martin Jr.'s classic book Chicka Chicka Boom Boom. If you haven't read Chicka Chicka Boom Boom, add it to your list. The silly story and fun rhyming words keep kids engaged. Mine like to read it again and again and have it memorized now. 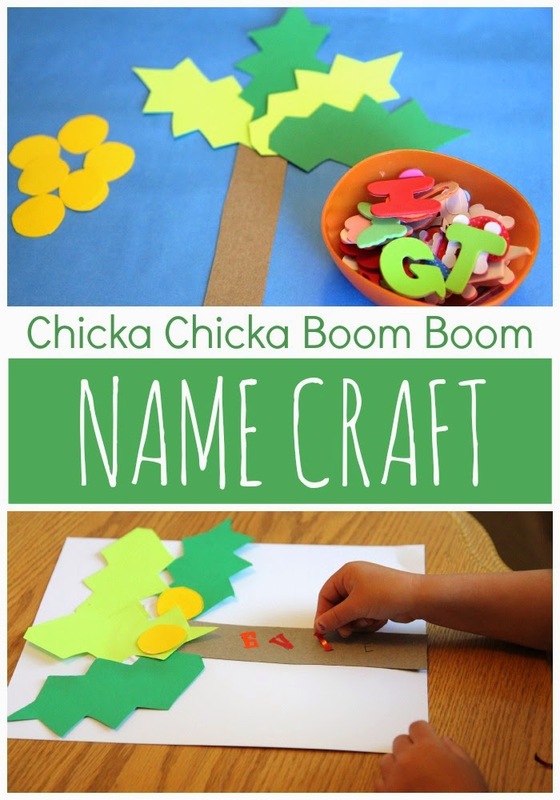 Over the years we have done a few Chicka Chicka Boom Boom themed activities and last week I put a new spin on an older Chicka Chicka Boom Boom name craft I did with my son when he was two (he is now six). This week we made an easy Chicka Chicka Boom Boom Name Sticker craft and practiced identifying and matching the letters in our name. I love name activities because kids are genuinely interested in their own names and therefore usually love creating with them. I think focusing on the letters in their names is a great first place to start when introducing the alphabet. To create, the kids assembled their coconut trees using white glue and all of the pre-cut pieces (older kids could cut their own paper). Then I wrote each child's name on their tree trunks with a pencil and then the kids matched the alphabet sticker letters to the written letters on the tree trunk. This was a great visual discrimination activity and they only needed a little help. After everything was glued on we let the cute coconut tree pictures dry. My favorite photo of the day was after preschool ended and I noticed my daughter's lips were covered with pink marker. I guess I got a little distracted helping the other kids and didn't notice her markering up her lips. It was too funny. You can barely see it, but I made her take a photo anyway. Note: In this activity I used alphabet stickers that are in all capital letters. It is hard to find cheap lowercase letter stickers, so I rarely have them around. It is better for kids to practice learning their names with a capital letter for the first letter and then lowercase letters for the rest of their name. You could create your own stickers by writing alphabet letters on circle dot stickers if you want to adapt this activity. My kids have had no problem transitioning to writing and spelling their names properly after using capital alphabet letters sometimes as 3 year olds, but for some kids the transition is harder. If you love Chicka Chicka Boom Boom then you'll want to check out these other adorable book inspired activities shared below. These ladies inspired me to break out this book and use it this week for preschool. Chicka Chicka Boom Boom Sensory Bin by Mama.Papa.Bubba. Watching the Chicka Chicka Boom Boom alphabet song on YouTube is totally fun to do too. 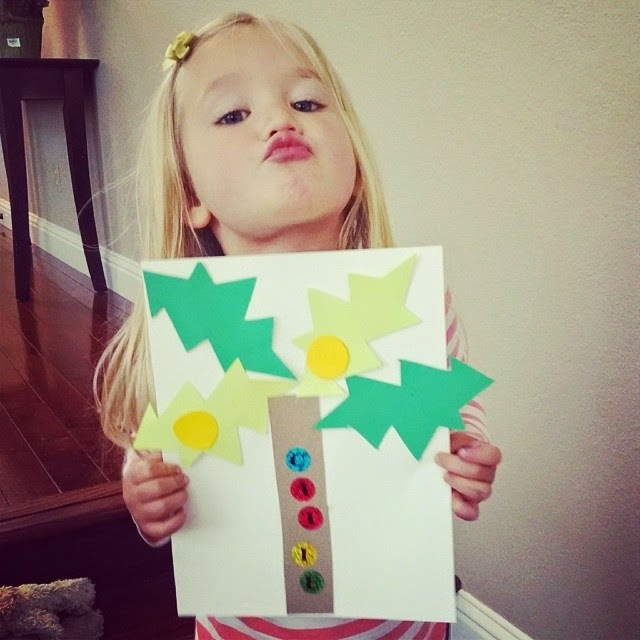 Do you have any other creative activities you've done as you've read Chicka Chicka Boom Boom? Come share! Great! Thanks so much for sharing all of these. Love your activity too!